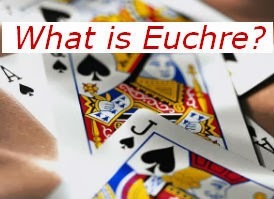 Here is a supply list and steps to run a Euchre Tournament for 8, 12, 16, 20, etc players or any number of players between 8 and 48. For this method, each player plays for themselves and players will have a different partner for each game. Place items needed on each table. Have a table at entrance to check in players. Each player will write their name on a separate line on the Main Euchre Score Board. This will be their number. They will get their own Euchre Player Score Card. Collect $ if playing for money. I find it helpful to have an envelope with extra 5’s and 10’s to make change. If playing for money, use Euchre Payout Table to determine how much to put in 1st – 4th place prize envelopes based on number of players. I think it’s fun to have a last place prize for the player with the lowest score. They receive a complimentary $5 prize. If you are collecting a quarter each time a team gets Euchred, you need a small container on each table to put these quarters in. You can also use this container to note the table number. For each game, use the Euchre Rotation Chart to determine which table each player will play at and who will be their partner. For each game, there will be 8 hands dealt. The deal will go around the table twice, with each player getting two chances to deal. 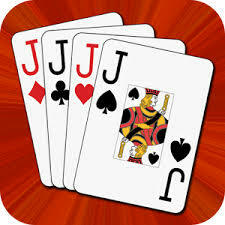 One player at each table will record the score for each team after each hand on the Euchre Table Score Card. The person to the left of the scorekeeper deals first, so the 4th and 8th deals will be the person keeping score. To keep things moving along, it is helpful to play "stick the dealer" and force the dealer to call trump if it is not called by any of the other players. After the game is complete, the players will record their score on their own Euchre Player Score Card and the Main Euchre Score Board. On the Main Score Board, the score for each game is recorded on the “Game” line and a cumulative total is recorded on the “Total” line. Having the scores written down is helpful when questions arise. If the number of players is not a multiple of 8, the players who sit out will receive a certain number of points for the game they sit out. These players can receive 7 or 8 points per game. For a Euchre Tournament, usually with regular-timed play, it takes about 2-3 hours to play 6 games with 8 hands dealt for each game. After all games are complete, the players with the highest total scores are the winners. They receive the prize envelopes. If collecting quarters for Euchres, those players who did not win a prize envelope would be eligible to win the quarters. You could use the Player Score Cards to select winners for the quarters.